Welcome to Biointensive for Russia! Biointensive for Russia is a people-to-people ecological gardening project, fiscally sponsored by Ecology Action. We promote Grow Biointensive Sustainable Mini-farming (GB) through publications and seminars hosted by environmental groups and agricultural colleges in Russian-speaking Eurasia. We also support mini-farming experiments conducted by our partner organizations the NGO VIOLA, Legend of the Russian Estate, and the Grassroots Alliance PERESVET in Russian-speaking Eurasia. We have also supported mini-farming experiments conducted in and near the Chernobyl radiation zone. We published in 2016, print-on-demand, Kak vyraschivat' bol'she ovoschei - the Russian translation of the latest edition of How to Grow More Vegetables by John Jeavons. Its original publication in 1993 was the inspiration for BfR, and the continued success of any efforts to promote Biointensive in Eurasia rested on its re-issue. Those unfamiliar with GB - for which double-digging of wide beds, propagation of seedlings in flats, composting, and intensive planting are tenets - can learn from Ecology Action’s interactive handbook on the resource-conserving gardening method, or even order any edition of How to Grow..., which is widely available online and in libraries. Longtime BfR partner Dr. Ludmila Zhirina of the NGO VIOLA in Bryansk renewed her collaboration with BfR in 2016, working enthusiastically with Biodynamic educator Irina Skiba and teacher Inna Yuzhakova of the Yaroslavl and Vologda regions to develop a strong program for Biointensive teacher training in in the north of Russia. Summer work camps at the Skiba training farm in 2017 and 2018 attracted teachers and students from a Waldorf school in Voronezh in Central Russia. For our report on this inspiring collaboration, please visit our new website. Ludmila and Irina traveled in February 2019 to Voronezh to teach at a conference of Waldorf teachers from 11 regions. In March, she traveled with Albina Samsonova (the first VIOLA member to attend an Ecology Action workshop in Willits in 1995) to Minsk, Belarus, to present at a conference of ecology teachers. It was sponsored by IPEN, a worldwide organization working toward a toxics-free future. Ludmila and Albina gave seminars and shared materials for presentations to women’s groups, and for school programs to encourage girls to study organic farming, as well as Grow Biointensive to be practiced in their family gardens. Having a strong background in pedagogy as well as biology, Ludmila has developed a comprehensive year-round school curriculum for teaching Biointensive. We have translated it into English and it is available on request. Another of Ludmila’s partners (through Friends of the Earth/the Russian Socio-Ecological Union) is Dr. Dmitry Filippenko, director of the Green Planet NGO in Kaliningrad, Russia's exclave on the Black Sea. Dmitry and his colleagues have taught Biointensive workshops in his province and in Sweden, and also arranged for book printings. promoted Biointensive at Eco-Schools/Green Flag conferences, and taught throughout the Bryansk oblast’, as well as in Kazan (Tatarstan). Their longtime experimental work is documented in several of our newsletters. In the summer of 2018, Albina Kochegina completed an experiment in companion planting at her dacha near St. Petersburg. Albina's report and photos are really interesting—if you would like to see them and/or receive BfR’s sporadic e-news with photos of those far-off, splendid Russian gardens, please let us know! For now, financial support will need to come from donors like yourself at whatever level is possible for you! Join Us if you'd like to help; in return, we'll keep you up-to-date with e-news and the occasional paper newsletter, which is posted to this site (see box at right). If you haven't already done so, sign up for our free email reports! 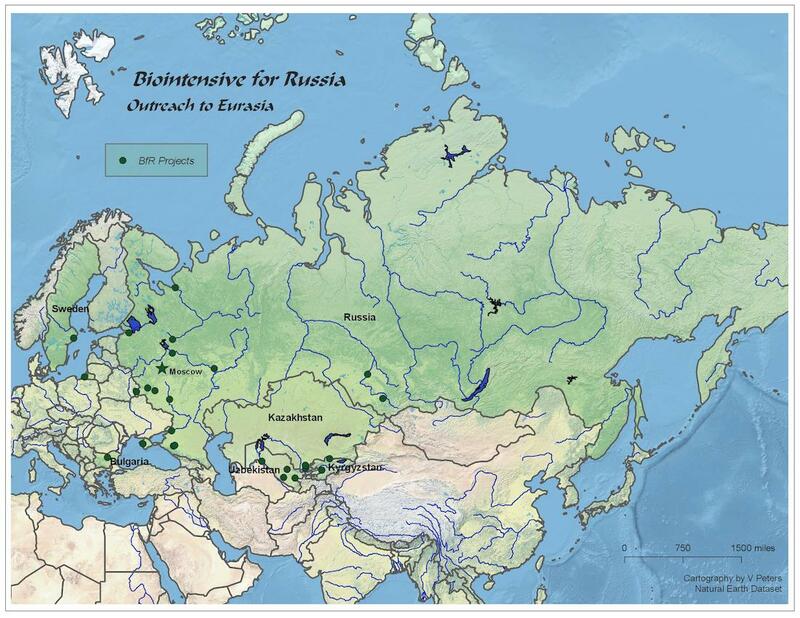 Locations in Russia and Central Asia where we and our Eurasian partners have held GROW BIOINTENSIVE workshops and conducted training programs from 1995 to 2019.